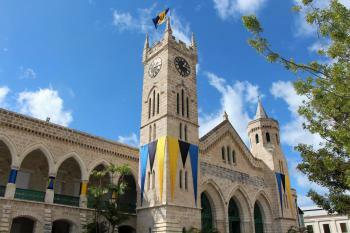 Historic Bridgetown and its Garrison is a 17th century British colonial city. The site comprises the old town, the port and the former garrison. The latter served as the headquarters of the British Navy in the region. Bridgetown was an entrepot for goods and slaves, linked to the island's sugar industry and the rest of the Caribbean. I was so surprised this one got in, I did not even prepare for it. I had to search old photo albums and digital collections for some pictures. In the process I even retrieved a long lost copy of my Bangladesh photos, so at least something good has come out of it! 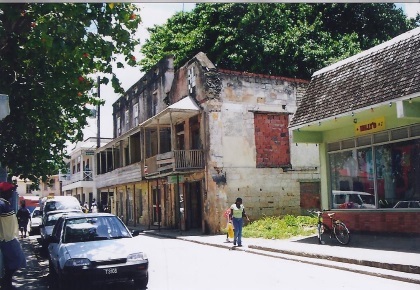 Finding Bridgetown photos proved to be hard ("Is this Bridgetown, or Speightstown?"). I never had gotten to paste the pics into the photo album and write captions. So I just guessed from the order they were in, and double checked them with photos of Bridgetown on the internet. I went to Barbados for a week in the autumn of 2003. It's a tiny island, very built-up and touristy in some places. I did not enjoy my stay here, and even "fled" for a couple of days to the paradisiacal neighbouring island of Dominica. But of course (and fortunately now) I did go to visit the capital Bridgetown. I went on a Sunday, and it was completely deserted. A bit rundown and spooky too. 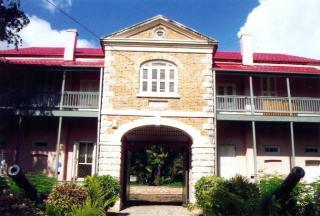 The only memorable part was visiting the Barbados Museum - located in the former prison of the Garrison. It shows the island's history, from the slaves to the cricket players. Bridgetown was by far the least impressive of the WHS I visited in the Caribbean so far. It has no doubt historic significance, but what I got to see was disappointing. There are many modern and ugly buildings between the often not well maintained colonial buildings. The only visual highlight for me was the parliament with its decoration in the national colours. The only thing that hinders you from ticking off this site within about 30 minutes is the distance between the town center and the Garrison. I visited Barbados in August 2014 as a member of a wedding party. We did not stay in Bridgetown, but I visited it twice during the week. 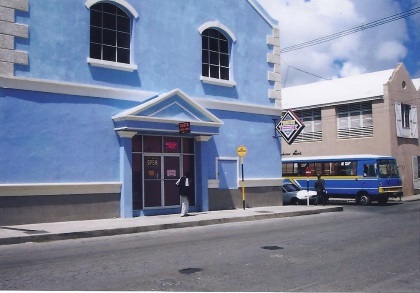 The first time, two friends and I caught a lively bus to the colourful town centre where we ate a lunch of jerk fish, cow heel soup and fried chicken in an orange sauce. A few days later we bussed again down the island's main highway to the sound of bashment music. We walked along the beach from the city centre and through the Barbados Yacht Club to see the garrison (taking care to avoid stepping on any evil Stonefish). On arrival we found a square of colonial-era buildings around a racecourse, which was rather underwhelming. The Barbados Museum cost B$12 to enter, and gives a decent overview of the island's history. Of particular interest to me were the theories as to what caused the extinction of the indigenous Amerindians, who has completely disappeared by the time the Brits arrived. Just observing the Careenage, and the Parliament Building should have drwn your attention to an island that has no interests,and is only 166sq.miles. 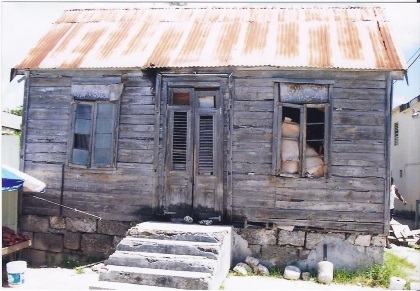 Then, the Garrison says why Barbados should be on the UNESCO's World Heritage List.That wooden house that was shown shows the fortitude of Barbadians,especially the slaves that were there for hundreds of years before emancipation. We traveled the length of the Antilles from Trinidad to Puerto Rico in 1993 using a LIAT Airpass during which we visited all the different countries., so Barbados was another “stop over” on the way north. We found each of the islands surprisingly different in geography, culture and atmosphere but I can’t say that Barbados was a “highlight” for us. We had a rentacar and took in all parts of the island – including Bridgetown. The only photo I have been able to find of that visit is a nondescript “family snap” of yours truly leaning against a cannon at the Garrrison Savannah Racecourse! Perhaps that says something about the sights on offer. Discussing our memories after 18 years with my wife she only remembered our coffee in the open air café at the Hilton! You should perhaps be aware however that what is “on show” is “The Barbados National Cannon Collection, with some of the most rare and oldest English cannons” (Wiki!). The country was notably wealthier than many of the others we visited and also busier and more developed. Bridgetown has its interests but has received a fair amount of modern development and lacks the “atmosphere” of less busy towns and capitals on other West Indian islands. I am sure Barbados has much to offer many tourists but cultural sightseeing is not its strong suit. ICOMOS recommended Deferral - OUV case not made, management issues, factual errors. Cam, Chi Mal, Eti, Tha, Irq, SA ("important for enslaved peoples") et al inc Fra, Brz support. Sui, Rus less convinced but were outgunned! Georgian Architecture: Buildings at Old Town and the Garrison are in a style called Caribbean Georgian: "simple symmetrical buildings with many features borrowed from the English Georgian but with overhanging first floor verandas that reflect the hot and humid climate"